Your support of our new graduates is needed now more than ever. Donations can be made by PayPal, or with a regular credit card if you do not have a PayPal account. Once you log in, SPHSAA-related announcements may be submitted from your MEMBER FUNCTIONS menu. For other notices CLICK HERE to read "POSTING ANNOUNCEMENTS". Is this your first time to the website? Click on Classes & Teachers then Classess and Classmates, click on your graduation year, find your name and click on it! Follow the directions to create your profile and enter your current contact information. Share personal memories, photos and videos! It's quick, easy, secure and FREE to do! 3) Agree to the website rules at the bottom of "HOW TO USE THIS SITE" page. Can't find your name? Click on "Contact Us" at the top of any page. 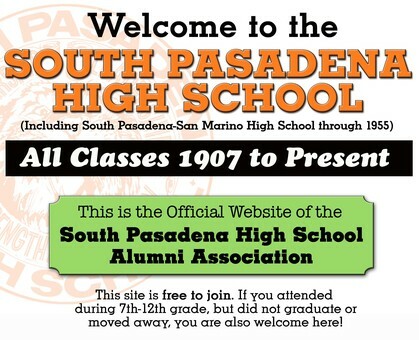 South Pasadena High School and the SPHS Alumni Association are not responsible for comments communicated by its alumni. If any visitor to this site feels that there is inappropriate comments or content, please click on the Contact Us link at the top of the website.